EARLING was platted September 1, 1882 by the Milwaukee Land company. Earling was a railroad town made up primarily of German immigrants. It was situated on the east branch of the Mosquito Creek, and on the Council Bluffs branch of the great Chicago, Milwaukee & St. Paul Railroad. Its original name was Marathon, but it soon took the name Earling after the President of the railroad. A post office was established in October, 1882 with Joseph H. Kuhl as postmaster. Freedom Rock® Tour painter Bubba Sorenson spoke at the Shelby County Freedom Rock dedication ceremony in Earling in July 2013. 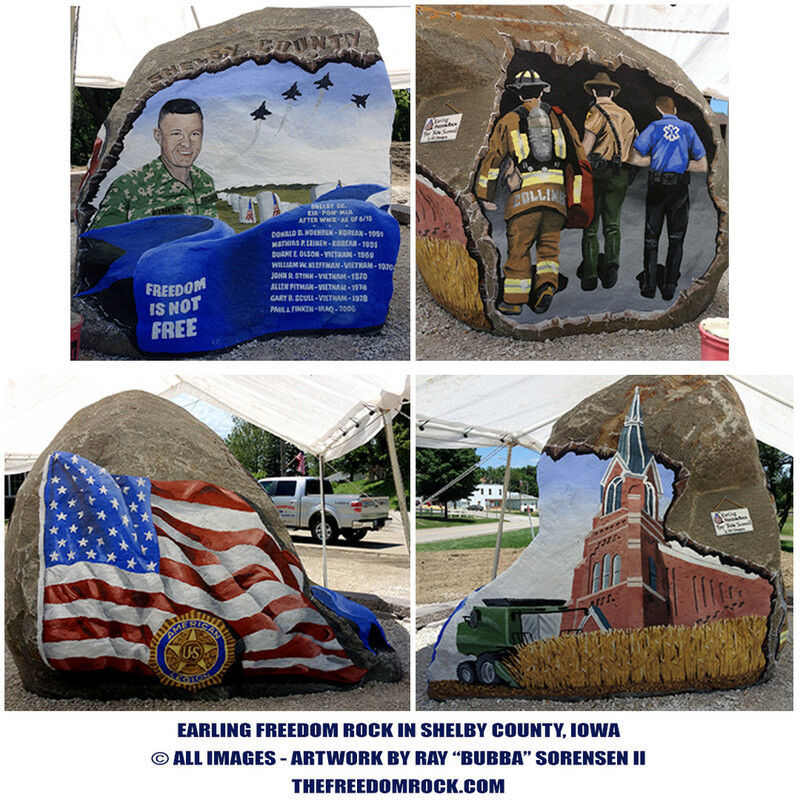 Sorenson, who first painted the original Freedom Rock near Greenfield in 1999, began an effort to paint a Freedom Rock in all of Iowa’s 99 counties. Visit this link to see all paintings on our Freedom Rock. Visit Travel Iowa for a current list of cities in Iowa. For more detailed information please refer to this document. ​Recycing: Contact your local hauling service. List of what is eligible for recycle. Earling is home to approximately 30 businesses including a nursing home, locally owned bank, tractor repair business, two car service stations, meat locker, grain elevator, two feed stores, ag-chemical store, beauty shops, and retail stores. Little Flower Haven is Earling’s largest employer with a 52-member staff that cares for 62 residents. The general public has the opportunity to view the museum and its contents every other August when Steve and his family and friends host the Hybrid Corn Pioneers Historical Expo at their farm. The museum is also open during summer months from June through August. Visitors come from across the country to see three varieties of wirecheck planted corn that farmers used between the mid 1850s and into the 1900s. A must-see for visitors coming to Earling. The circa 1882 Church with its soaring 150’ steeple and Gothic-styled architecture is breathtaking. Its numerous stained glass windows illuminate a spacious interior that is both enthralling and inspiring. Statues depicting the saints and the Stations of the Cross decorate the wall and the columns. A visit to St. Joseph Catholic Church will never be forgotten. A two day picnic celebrated on the second weekend of July with festivities consisting of live music, carnival rides, games, and plenty of food and beverages.